Description of "Notes On Vector Calculus (eBook)"
It starts from +2 level revision of vector differentiation and runs through elementary mechanics.Then a whole big chapter for partial differentiation, through orthogonal coordinates ,leading to Lagrange's equations . Then the motivation for vector operators gradient, divergence and curl , again from +2 level and up to Integral tranformations, Jacobean, Gauss' theorem, Stoke's theorem, Green's Theorem and runs through Laplace's equations, Poisson's equations, wave equation, heat conduction equation. and their elementary solutions. Thus , this teaching of vector calculus widows into complex analysis, Calculus of variations, Fourier series , Maxwell's equations, etc. A second edition is planned to deal fuller treatment of each chapter with applications and problems. The author believes in rewriting mathematics from three simple concepts, identity, division and symmetry, and yet not at the cost of sacrificing academic rigor.This is his 13th book on line. The author shall be grateful if somebody makes some testimony, suggestions or simply point out mistakes, typo or otherwise. 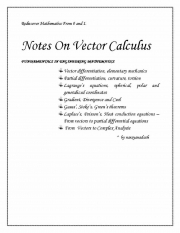 Reviews of "Notes On Vector Calculus (eBook)"